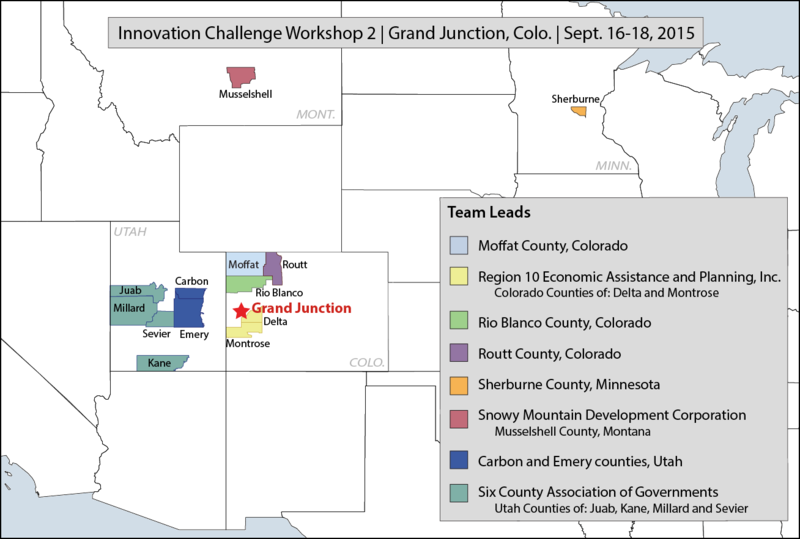 The second Innovation Challenge workshop will be held in Grand Junction, Colo., from September 17-19, 2015. The teams selected to participate in the workshop competed earlier this year to win spots at the event. Each team is led by counties and regional development organizations and includes a broad range of other public and private sector partners. Below, read more about the teams that were selected. More information about the Innovation Challenge for Coal-Reliant Communities can be found by visiting: naco.org/InnovationChallenge. Team Lead: Moffat County, Colo. Team Lead: Region 10 Economic Assistance and Planning, Inc.
​Representing Delta County and Montrose County, Colo. This team includes representatives Delta County; the City of Delta; West End Economic Development Organization; and Telluride Foundation for West End Montrose County. ​​Team Lead: Rio Blanco County, Colo.
​This team includes representatives from Rio Blanco County; the Town of Rangely; Rangely Chamber of Commerce; Colorado Northwestern Community College; and Rangely Auto Parts. ​Team Lead: Routt County, Colo.
​This team includes representatives from Routt County and the Steamboat Springs Economic Development Council. Team Lead: Sherburne County, Minn.
​​This team includes representatives from Sherburne County; Xcel Energy; Initiative Foundation; Greater St. Cloud Development Corporation; and the City of Becker​​​​​. This team includes representatives from Musselshell County; the City of Roundup; Coila Evans Art & Gift Gallery; and ABT Companies. This team includes representatives from Carbon County; Emery County; Utah State University’s Darbon Energy Innovation Center; and the Southeastern Utah Economic Development District. This team includes representatives from Sevier County; Kane County; Juab County; Millard County; and Snow College.